Cosimo de Medici was born in Florence, Italy, on September 17, 1389. His father Giovanni was a successful banker, and Cosimo would learn the business from him. As a young man Cosimo ran wild, impregnating a Cirassian servant who left him with an illegitimate son. Eventually, he would settle down and become a hardworking businessman. Cosimo married the Contessina de Bardi, and they had two sons named Piero the Gouty, and another named Giovanni. At the time, Florence was a thriving financial center where 72 bankers conducted their business. Cosimo was the largest banker of them all, and the wealthiest man in town. He lent thousands of gold “florins” to the dukes and kings. His biggest customer was the pope. For a percentage, Cosimo collected the church revenue before distributing what was left over to the church treasury. At the time, Medici traveler's checks were accepted almost anywhere. Before long, Cosimo would open up bank branches in Milan, Pisa, Venice, London, Rome, Geneva, Avignon, and Burges. Over the next 15 years he made enormous amounts of money. 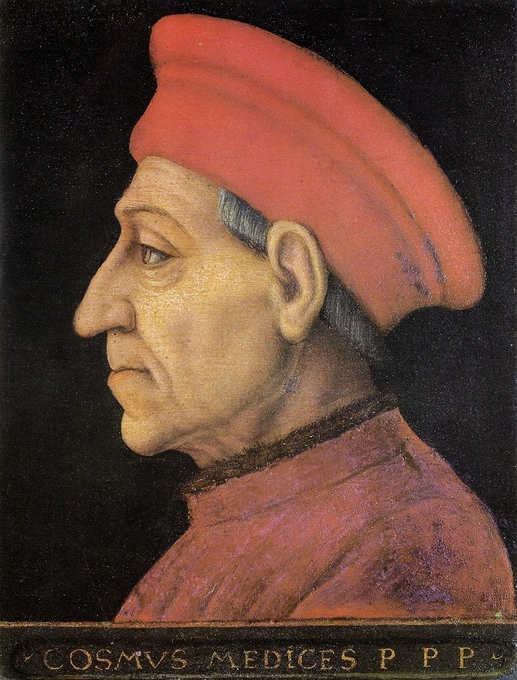 Cosimo would use much of his fortune to control the political scene. At the same time he would spend enormous sums of money sponsoring the arts. This sum would easily be into the hundreds of millions of dollars in today’s money. Cosimo became very popular with the guilds-men. The guilds-men enjoyed the democratic Florentine government where they could vote and hold office. At the same time they all wanted peace. Florence had fought in wars for hundreds of years and now they had peace and prosperity and they all wanted it. Cosimo only held political office one time for 6 months. However, his judgment was considered the rule, and over the years the civic leaders did as he told them. As a result, Cosimo brought great wealth to many merchants and bankers. He also introduced a tax that was much harder on the rich. When Cosimo died his son Piero became the head of the Medici family. Piero would spend most of his life crippled by gout, Unable to walk he had to be carried from room to room. Because of his debilitating disease be rarely left his home. Fortunately for the Medici, he would have a brilliant son named Lorenzo or Lorenzo the Magnificent as he became known. Lorenzo possessed a larger than life personality. He rode fast horses, loved to sing, flirted openly with girls, told great stories, and loved to party. He was also one of the greatest poets of the Italian Renaissance. Piero would marry Lorenzo to Clarice Orsini, who was from a very prominent Roman family. The marriage was amazing, even for the Medici. For the event, they cooked 150 calves and over 4,000 roosters. Piero would die just six months later, and Lorenzo took over his father's position. Before long Lorenzo and the Medici family were at odds with another powerful Florentine family that was headed by Francesco de Pazzi. Then on April 26, 1478, Lorenzo went to mass with his brother Giuliano. When everyone bowed their heads Francesco and his men attacked killing Guiliano. Lorenzo was stabbed in the neck, but he pulled out his sword and fought off the aggressors. Soon after, Lorenzo would be weakened by gout. He died at the age of only 43. He was succeeded by his eldest son Piero.